GameBox » News & Event » [Christmas]You should get your Xmas present! [Christmas]You should get your Xmas present! [Christmas]Player still need this Christmas Tree 2018! Dear commander, Christmas day has passed, but we bet that you still need this Christmas Tree for benefits! 1. 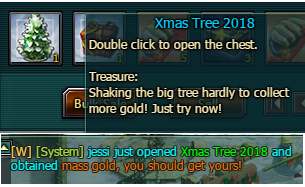 During the event time, player who spends every >=999 gold can claim Christmas Tree 2018*1 as extra reward. *Player can get 100-500 gold in random from using the item. 1. Only the in-game gold consumption is counted, each player can bring 10 trees home at most. 2. Player needs to contact GM for the reward after spending gold. [Christmas]Consume improvement files&get better return! Player may get red-number(negative) from refreshing attri. by using improvement files. That's bad if it happens sometimes. But why not take a risk? We offer a chance for you now. 1. Consume every 25 Gold improvement files can get 1 Platinum improvement file. 2. Consume every 15 Platinum improvement files can get 1 Diamond improvement file. 3. Consume every 10 Diamond improvement files can get 1 Supreme improvement file. 4. Consume every 10 Supreme improvement files can get 2 Supreme improvement files. PS: Before and after screenshots are required. 1. Player needs to CONTACT GM to claim the files rebate by providing nickname/server name. 2. The event reward will be valid until 23:59 12/27 PST, please claim it in time. 3. The number of improvement files that player consumes is rounded. For example, if player consumes 63 gold improvement files, he can claim 2 Platinum improvement files as rebate. 4. GW Team reserves all rights of holding this event. [Christmas]Advanced plan to get instance chances next week! Dear commander, As for the Xmas instance event, you should collect more instance chances for the dream units! The instance chances is a regular supplement that player needs to collect them for instance event and decent BP items. This time we offer a chance for you to get up to 300 instance chances for free in next week. How to get them? 1. Player who recharges >=60USD total payment(12/26-12/27) will get 50 instance chances on 01/03. 2. Player who recharges >=100USD total payment(12/26-12/27) will get 100 instance chances on 01/03. 3. Player who recharges >=200USD total payment(12/26-12/27) will get 160 instance chances on 01/03. 4. Player who recharges >=300USD total payment(12/26-12/27) will get 230 instance chances on 01/03. 5. Player who recharges >=400USD total payment(12/26-12/27) will get 300 instance chances on 01/03. 1. Each player can claim the reward for once only. The instance chances will be sent out on 01/03/19 PST. 2. GW Team reserves all rights of holding this event. [Christmas]100% LT Gold rebate only in Christmas day! Dear all, Merry Christmas! In the most happy day of this year, we offer this 100% bonus for you only in 12/25! 1. During the event time, player who recharges single payment from 10USD to 500USD can get 100% LT gold rebate. 1. The reward is not stacked and each player can claim it for once. Single payment of 10/30/60/100/200/300/500USD is counted. 2. The LT gold will be sent out within 24 hours after the event. [Christmas]50% OFF for Unloading Camouflage items! During the event time, player who unload camouflage item that cost gold can get 50% of gold cost rebate! 1. Player needs to contact GM after unloading camo. item in game for gold rebate, once only. [Christmas]Get free VIP time in Christmas day! 1. Single payment of 30USD on 12/20 and buy the 90 days VIP3(799 GOLD) can claim 500 gold as rebate. 2. Single payment of 60USD on 12/20 and buy the 180 days VIP3(1499 GOLD) can claim 800 gold as rebate. 3. Single payment of 100USD on 12/20 and buy the 180 days VIP4(1999 GOLD) can claim 1200 gold as rebate. 4. Single payment of 200USD on 12/20 and buy the 180 days VIP4(1999 GOLD) can claim 1999 gold as rebate. 1. The gold rebate cannot be stacked and each player can claim it for once only. Please contact GM after recharging and buying VIP time in game. [Christmas]It's not Xmas without Christmas Tree 2018! 1. During the event time, player who spends every >=999 gold can claim for one Christmas Tree 2018 as extra reward. [Christmas]Everyone deserves this Orange Tigerking-210 unit! Dear all, some of you may have owned the Orange Tigerking 150/170 in your account, there is no doubt that Orange Tigerking unit is doing an excellent job in battle, so this time we introduce the Orange Tigerking-190&210 to you. 1. Please CONTACT GM to complete the trade-in deal, make sure that there is enough gold in your account to complete the deal. 2. Please take off the camo. item/General/Equipments/transfer the improved attributes BEFORE the trade-in. An EXP compensation pack is offered for this trade-in deal. 1. Player who recharges >=60USD total payment(12/19-12/20) will get 50 instance chances on 12/26. 2. Player who recharges >=100USD total payment(12/19-12/20) will get 100 instance chances on 12/26. 3. Player who recharges >=200USD total payment(12/19-12/20) will get 160 instance chances on 12/26. 4. Player who recharges >=300USD total payment(12/19-12/20) will get 230 instance chances on 12/26. 5. Player who recharges >=400USD total payment(12/19-12/20) will get 300 instance chances on 12/26. 1. Each player can claim the reward for once only. The instance chances will be sent out on 12/26 PST. [Christmas]Odd or Even? It's your choice! Hi commander, what's your HQ level in game now? Do you know that the HQ level number may bring good luck to you in one day? How does it work? Let's check it out! 1. The mantissa of Current HQ level is odd number(1/3/5/7/9) can get 200% LT gold rebate of each single payment(>=10USD). 2. The mantissa of Current HQ level is even number(0/2/4/6/8) can get 100% LT gold rebate of each single payment(>=10USD). 1. The current HQ level is objected to the one that player achieves at the end of the event(23:59 12/13), GM will check the account and send LT Gold reward within 72 hours after the event. 2. Player can claim the LT Gold rebate for 2 times(2 single payments) and 10000 LT gold at most. Dear commander, The instance chances is a regular supplement that player needs to collect them for instance event and decent BP items. This time we offer a chance for you to get up to 255 instance chances for free in next week. How to get them? 1. Player who recharges >=60USD total payment(12/12-12/13) will get 50 instance chances on 12/19. 2. Player who recharges >=100USD total payment(12/12-12/13) will get 80 instance chances on 12/19. 3. Player who recharges >=200USD total payment(12/12-12/13) will get 120 instance chances on 12/19. 4. Player who recharges >=300USD total payment(12/12-12/13) will get 180 instance chances on 12/19. 5. Player who recharges >=400USD total payment(12/12-12/13) will get 255 instance chances on 12/19. 1. Each player can claim the reward for once only. The instance chances will be sent out on 12/19 PST. [Christmas]No bargain! 50% rebate of equip fusion! You should have better Golden equip set, don't you? No bargain, 50% gold rebate of equip fusion! During the event time, player can fuse gold equip BP with gold and get 50% gold cost rebate from GM. 1. Only fusing equip with regular gold is counted into this event, Limit-time gold is not counted. Each player can claim 5000 gold at most as 50% rebate. 2. Please contact GM for the gold rebate before 23:59 12/11 PST. [Christmas]UP to 50% gold bonus for you! UP TO 50% REBATE! In the end of 2018, we wish you would get together with your families and have a great day! Day 1(12/06): Single Payment 30USD/100USD/200USD can get 50% of recharge gold as extra reward. Day 2(12/07): Single Payment 10USD/60USD/100USD/300USD can get 25% of recharge gold as extra reward. 1. Only the specific payment on each day can get extra reward, each level of payment can not stack and only claim for once. Player can get the extra reward for 2 times at most. 2. The reward will be sent out within 72 hours after the event. [Christmas]Taste fresh stuff! The new Xmas battle items are arrived! 1. During the event time, single payment of 30USD can claim Jungle Bell A+*5 as extra reward. 2. During the event time, single payment of 60USD can claim Jungle Bell A+*10 as extra reward. 3. During the event time, single payment of 100USD can claim Jungle Bell S*10 as extra reward. 1. The reward cannot be stacked and each kind of reward can claim once. The reward will be sent out within 24 hours after the event.